At Jarrods we’ve had the pleasure of working on a number of creative staircase projects, whether we’re creating a new bespoke staircase from scratch or working on a staircase renovation. You can find out more about a few of them in our Customer Stories series. But we also like to keep on top of the latest staircase designs from across the world. So we thought we’d start to share a few of these Stunning Staircases when we find them, to offer some inspiration for your own dream staircase. 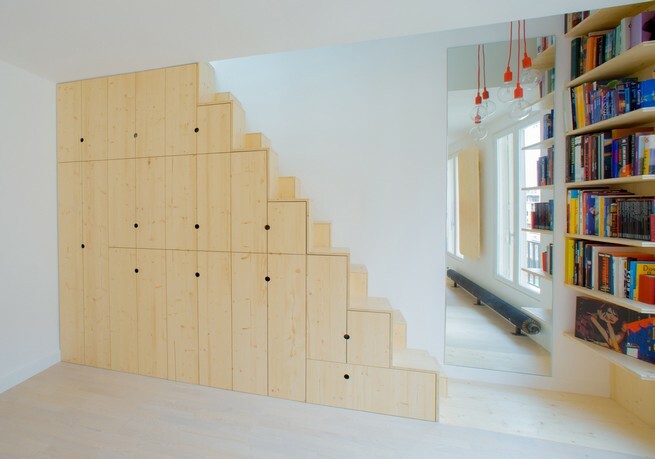 Having created a staircase with a built-in wine cupboard for one of our customers, we were particularly impressed by these innovative examples of staircase storage solutions. Studio Mieke Meijer is a collaboration between Mieke Meijer and Roy Letterlé at their workshop in Eindhoven. 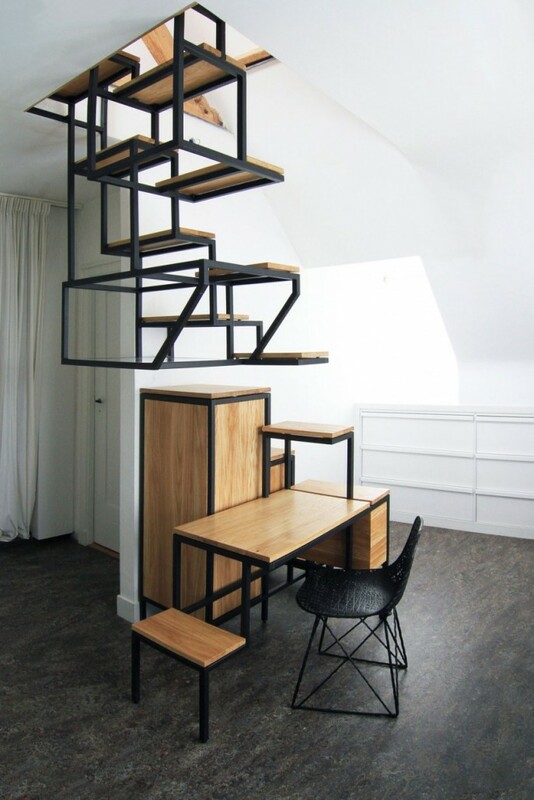 Their staircase installation, called objet élevé, is a staircase split into three parts that not only connects two floors but also acts as a space to work, collect and store. With a mixture of both suspended and standing sections, its open frames create an airy structure that, despite its size in the room, still allows plenty of light to reach the space. It also makes for some rather beautiful geometric shapes. Levitate, a design-led practice of architects, created a secret staircase for a flat in the shared top floor of a Victorian mansion block in London. 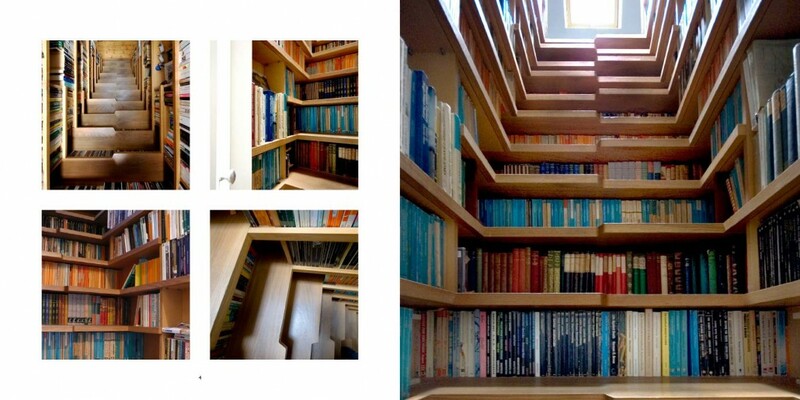 This library staircase has English oak treads and shelves completely filled with books on all three sides. The skylight above encourages people to stop, sit and browse a hardback. Essentially an upside down sedan chair, the design for the structure of the chairs carries the whole weight of the stairs and books back to the main structural walls of the building. Dangling from the floor above, it avoids affecting the residential floors below and makes a rather impactful first impression for anyone entering the room. 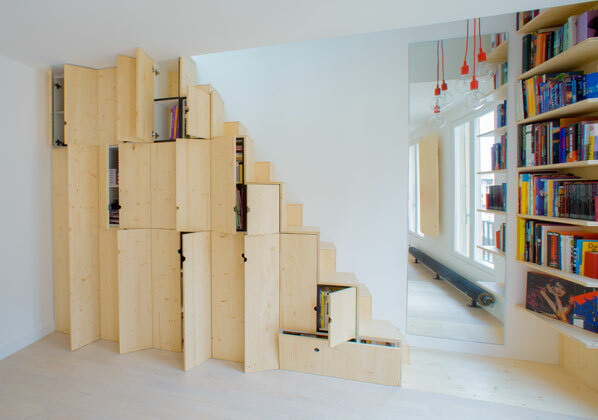 French architecture firm Schemaa improved the storage space in a Parisian apartment by installing this intricate cupboard staircase. In a range of different sizes, the cupboards are easily disguised when the doors are closed. The wood was even chosen to match the same material that was used in the apartment’s kitchen units, something we always try to do in our own staircase projects to create consistency throughout the property. 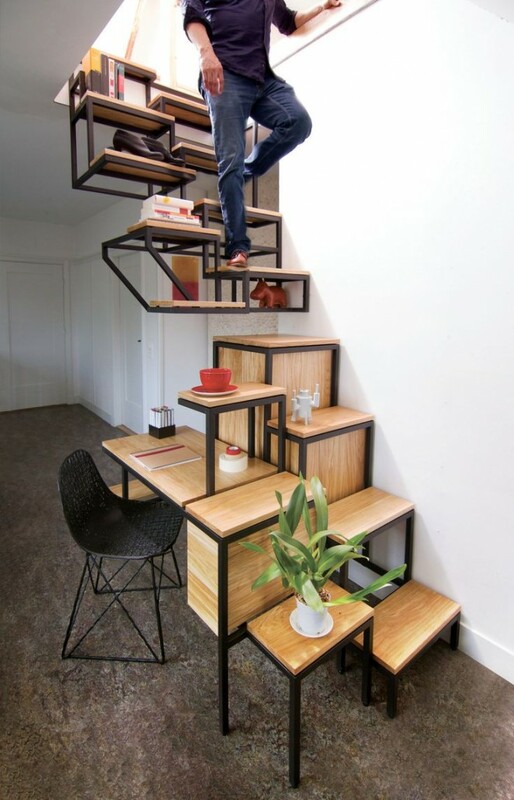 If these stunning staircases have given you some storage inspiration, the team at Jarrods is ready and waiting to help you bring your dream staircase life. Get in touch today, tell us what you’ve always wanted and we can help you create your own stunning bespoke staircase.